Free CAD downloads up. Further growth predicted. 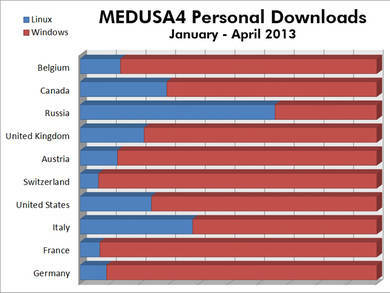 Downloads of CAD Schroer’s free 2D/3D CAD suite for Windows & Linux were up 10% at the start of 2013 compared to 2012. Further growth is predicted for 2013, with the latest release just out. Cambridge, UK and Pittsford, NY – 17 July 2013: In spite of a wide choice of free CAD programs of varying quality and complexity, CAD Schroer’s MEDUSA4 Personal software, used in 165 countries, has seen a 10% increase in downloads in the first four months of 2013 compared to the same period in 2012. 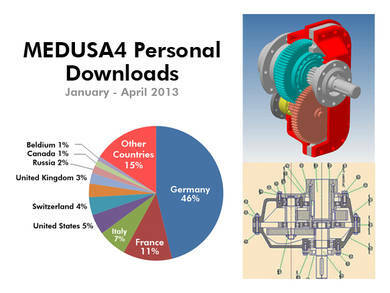 CAD Schroer believes the continuing rise in downloads is due to the comprehensive professional toolset provided in MEDUSA4 Personal, which includes extensive 2D drafting and editing tools, basic 3D, parametrics, image integration, and a sheet metal design module. “We also keep simplifying the free license request, software download and installation process, as well as adding new tutorial videos to our website,” explains Sergej Schachow of CAD Schroer. MEDUSA4 Personal is updated regularly, benefitting from new developments in the commercial version a few months after their initial release. The latest update was released in April. CAD Schroer’s eSERVICES portal (http://eservices.cad-schroer.com), launched in response to requests from business users, enables designers to use their work commercially by converting drawings to PDF, DXF or the professional MEDUSA4 .SHE format for a small fee. “It’s helping many people turn a hobby into a business,” says Sergej Schachow, “and we’ve seen around 40% growth in registrations on the portal recently.” In Germany a plotting service allows users to upload their MEDUSA4 Personal designs to get them printed in A0, A1 or A2 formats, delivered straight to their door. These drawings can then also be used commercially. 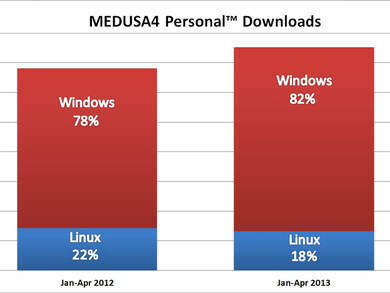 As one of the first free high end CAD systems available on Linux, MEDUSA4 Personal continues to remain popular with Linux users, with 21% downloading the 2D/3D software on Linux in 2012. Top download country Germany saw a 12% growth in Linux users (now 8.9%) in the first part of 2013, although the overall proportion has so far been slightly down from 2012. Canada (29.2% Linux) and Belgium (13.6% Linux) have replaced Brazil and Spain in the top ten download locations this year. They join France (6.6% Linux), Italy (37.9% Linux), the USA (24% Linux), Switzerland (6.1% Linux), Austria (12.6% Linux) and Russia (66.7% Linux).